It took me such a long time to get back to this book. I completed two other books since I finished Winter. The Art in a Child’s Hand board book that I made for Art Continuum, and another book that I dislike so much, I can’t even bring myself to write about how much I dislike it. 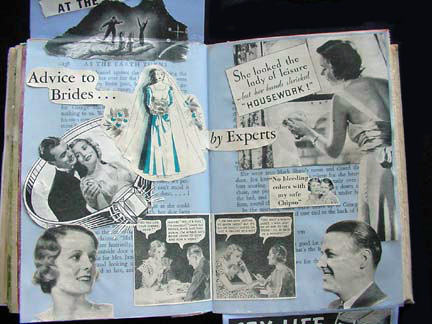 I started getting more into doing collage work, but my Earth book just kept beckoning me. It felt good to work in it again. 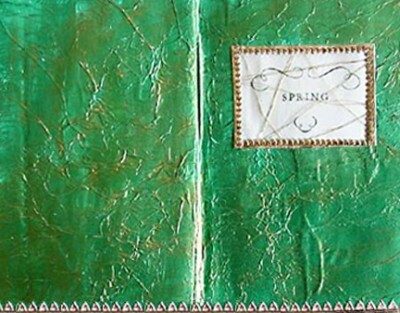 First I cut out the window that would go over the section title “Spring.” Next I painted the pages with white gesso. I originally wanted to have a smooth surface to paint on, but as you can see, that idea fell by the wayside. Instead, I put more gesso on the pages, took some white tissue paper, crinkled it up really good, and stuck it over the pages then painted more gesso on top. I rolled a brayer over the tissue paper to press out air pockets and prevent more wrinkling. I stuck wax paper between the pages after they had dried, closed the book and flattened it. It took a few days before I could work on it again. 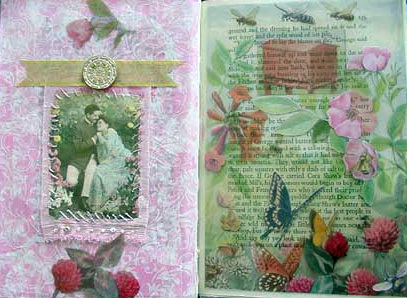 Next I painted over the pages with the Lumiere Pearl Emerald Green paint. I tried to be very careful not to let any paint slip under the left page, since my winter tree scene is directly behind it. Even though I had placed waxed paper underneath the pages I was working on, some of the gesso had worked it’s way underneath along the edges. It wasn’t too bad since the gesso was white, but the green would have been disastrous. I let the paint dry for a little while but I wanted to work some gold Pearl Ex into the paint. I had made some gorgeous gesso paper with the green paint and gold powder during the summer, and I was hoping to re-create that look. Unfortunately, I didn’t take notes about the EXACT shade of gold PearlEx I used. When I started spreading the Aztec Gold across the green paint I realized that this was the wrong shade. It was too light and brassy. So after I put it over the spread, I took some remnants of emerald pearl paint and painted it on top of the gold. This gave the gold a tone I could live with. 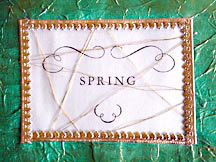 I stitched gold thread across the window/title opening and it looked very cool. I used gel medium to glue the underside of the page to the page behind it. 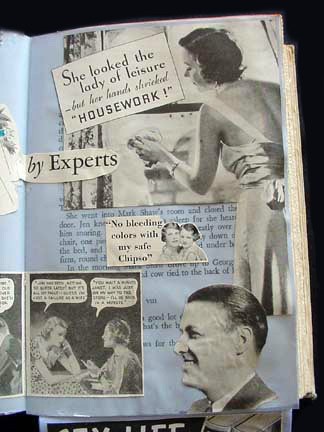 I then glued the art papers around the window at at the lower edge of the pages. I made a wax paper sandwich and flattened the book for the night. Everything was looking fine. However, when I opened it up the next morning, I discovered that the threads had slackened and were no longer tight across the window. My guess is that when the papers got damp from the gel medium, they shrank a bit, which loosed the stitching. It doesn’t look too bad, but I don’t like it as much as before, and I can’t really thing of a way to remedy the situation. Make a test page when you’re trying something new. After sewing threads across the opening the way I did over the title, tape down the threads along the edges on the underside of the page. I’m afraid the loveliness of this page doesn’t really show through in the picture above. I have to say that I was really surprised with how well the leaf paper turned out. I didn’t dry the leaves at all, and I didn’t think they’d last; however, it’s been several months now, so I’m hopeful that they’ll stay fresh-looking. During the summer I made the paper that covers these two pages. This is how I did it: I took a piece of tissue paper and placed it on a piece of freezer wrap. I covered it with a coat of gloss acrylic medium. Then I placed the Japanese maple leaves that I had picked from my tree earlier in the day, and placed them on top of the wet tissue. After that I took a second piece of tissue, laid it on the freezer paper next to the leaf covered sheet, and covered it with medium. I gently, oh so gently, lifted up the second wet sheet of tissue, flipped it over, and placed it on top of the other one. I smoothed both sheets together, making a tissue-leaf sandwich and let it dry. I did the same thing with flower petals, but by the next day, all the pink petals had turned brown. I was afraid the same thing would happen with the maple leaves, but it didn’t. They look as good today as they did when I plucked them from the tree. I painted the book pages with a wash of acrylic inks. Next, I cut this decorated paper to the size of my book’s double page spread, and using acrylic medium again, glued it to the pages. I have to remember to open the spread really deep into the gutter. If I glue something across the page, and the center crease doesn’t go as far down into the center as it can, then this has a negative impact on the way the other pages around it open and close. Well, this page was quite an adventure with plenty of twists and turns along the way! Here’s how it went: I painted my double page spread with magenta inks. I had a really lovely magazine picture of a spring meadow filled with pink and yellow flowers. 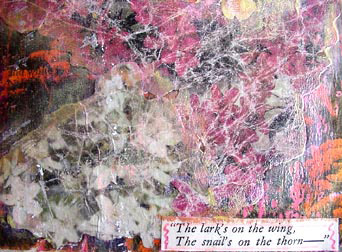 I was going to cut the meadow into strips and lay them across the page and then put the text between the meadow slices. I still like that design idea and will probably try it on another page in the book. when the wild geese came back. or hot beach rocks in the beds. and the whippoorwill in the lilac bush. but restless, as if life quickened in them. and the Strawberries had blossomed. Wild geese had brought the SPRING. 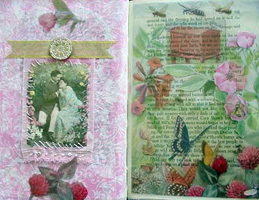 I decided to do an image transfer of my meadow magazine picture onto the page. I wanted to use a technique I had learned in a workshop by Jonathan Talbot this summer. I painted fluid gloss medium over the book pages and let them dry. I did the same thing with the magazine pages. Then I laid the magazine pages face down on top of the book pages, covered them with release paper, and used a small tacking iron to adhere them to each other. I took a small pot of water and a cloth and slowly removed the magazine paper until only the image remained. And what a shock that was! What happened was the yellow flowers on the pink ink became orange, and the green grasses on the pink ink became black. It was amazing, and not at all what I imagined. I showed it to every member of my family. “I can’t decide if I love this or hate it,” I said. “What do you think?” The youngest boy (11) mulled it over and said, “I hate it, Mom. I think you should tear it out.” Talk about brutal honesty! Next I asked my biggest boy (my husband). He looked it over at arm’s length and up close. “What is it supposed to be?” he wondered. “I’m not sure anymore,” I answered. “It’s okay,” he said. “Don’t tear it out.” Evenly divided. My middle boy (17) wasn’t home yet. I went back into my work room to stew. About an hour later, in saunters the adolescent, walks straight to the book (how did he know?) picks it up and declares, “That’s cool.” That was the tie-breaker, and I was relieved because it was starting to grow on me. Sort of. As you can see, I continued to futz with it. I took some other flower clippings, crinkled them up and washed them under water. I glued them on the right side with matte medium. I took oil pastels and tried to highlight the edges of the flowers and rubbed it in, so they almost look like they’re glowing. I laid the text across the page, and then used a gel pen to draw in some of the pink and orange since the white text seemed too stark. 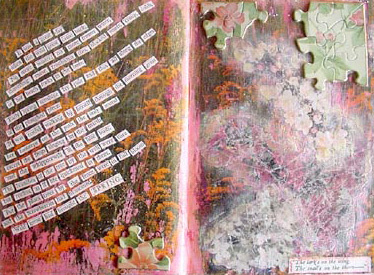 I found some puzzle pieces and used the Krylon pen to color the edges and PVA to glue them to the page. I covered the whole thing with PPA so that the pages wouldn’t stick together. And then I declared this page officially over and done! Finally . . . I think . . . When doing a transfer, be sure to consider the interplay of colors on the transfer and the page. Also, make sure both papers are completely covered with medium. Do two coats if necessary. I purchased a new printer as a belated birthday present to myself. It was the Epson Stylus C82. It used the DuraBrite pigment inks and has four separate ink cartridges. I was tired of running down to make color copies, so that I could use them in my art. These inks are waterproof and fade resistant. So far, I’m really happy with how it’s printing, although it is a bit on the noisy side when the paper first feeds into the machine. When I originally started these pages, I didn’t intend to go pink again. I had made a yellow background using inks on wrinkled Tyvec, and I was planning on using that. But then I got the idea for the transparency, and when I laid it on top of the yellow Tyvec, the pink flowers turned orange, which was not the look I was going for. Still, green, yellow, pink, orange – these are all the colors I associate with spring. It makes me think of my mom’s garden and the brilliant colors of the California and Iceland poppies she has planted there. My mom used to spend hours in her garden, dead-heading the flowers, gathering the seeds, pulling weeds, and transplanting. As she got older, she tended to spend more time sitting in her easy chair watching TV. I loved my mom a lot, and I was grateful that she was still with me, but sometimes I missed the gardener. These pages make me think of her. I used the printer to make the transparency on the right hand side of this double page spread. I scanned this picture, resized in in PhotoShop and then printed it on the Apollo transparency film using the transparency setting. I bought this film because it’s the brand Leslie Riley recommends for ink jet transfers, and I am hoping to try that technique soon. If you decide to use some transparencies for your art, you might want to learn from my mistakes. First of all, be very careful with the glue if you plan on gluing on top of the transparency. Any kind of moisture on the film can make the image smear (which is one of the reasons it works so great for transfers.) Don’t try to rub off misplaced glue or paint; let it dry and then scrape it off gently with your fingernail instead. 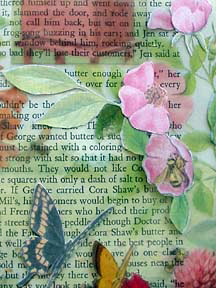 To attach a transparency to the page, you can use eyelets, brads, PPA, or gel medium. Remember that the transparency is a lot less flexible than other pages in the book, so keep that in mind when you’re planning where to put it. I also made another two copies of the same picture on premium ink jet paper. One is just the same as the original image. The other was flipped horizontally. 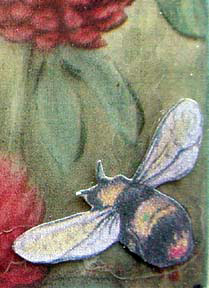 I cut out some of the flowers, bees, and butterflies and glued them onto the top and under sides of the transparency. I think this caused the image to have a three dimensional feel to it. I adhered the transparency to the page using gel medium. On the other side I painted the page with the Pearlescent acrylic ink in magenta. Then I tore pieces of decorated tissue paper and glued it down over the paint. I was hoping to make the pink fade out a little bit more than it did. I’m not too happy with the lack of contrast between the pink fabric and the pink on the page. 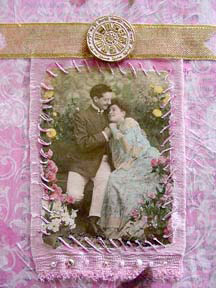 I tore around the image of the couple and glued it down onto the fabric scrap. Then I stitched around the edge of the picture. I used three different colors of pink thread through one needle. I really like the look and texture of threads stitched through paper; I’m not sure why that is. I also sewed some little seed beads along the bottom of the fabric. 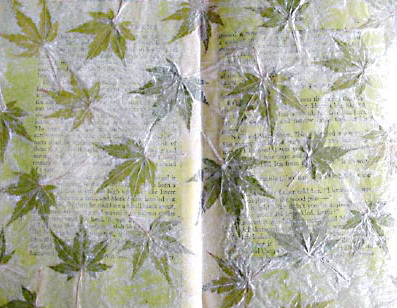 I used the Lineco glue to attach the fabric to the book page. I glued the gold ribbon over the top edge and glued my fancy button in the middle. When I used the Lineco to glue the paper to the fabric, I didn’t have any glue spots at all. But this time, when I glued the fabric to the page, the glue seeped through the fabric and left dark blotches, as you can see below. Next time, I will apply the glue with a brush in a thinner layer. I’m still debating on whether I should have used a light dash of glitter to try and hide these spots. The back of the button had a one piece molded metal shank. I used some wire cutters and brute strength to take off the shank so that the button would lie flat on the page. I also gave it a couple of whacks with a hammer. It’s still a little too high off the page, but not as bad as it was. I didn’t need all of the pages in the spring chapter, so I pulled quite a few out, hoping to make the book less “stuffed.” Unfortunately, this created more problems for me. I don’t remember having this difficult a time getting the pages to lie flat in my last book. When I glue several pages together, the page lays open fine, but when I try to turn the page, the pages bunch up along the gutter and make a ghastly looking wrinkle. It’s hard to explain, really, but I’m having to do all kinds of camouflage work to get the pages to look okay. As I mentioned in “lessons learned,” I think this problem is caused by the chunks of pages I removed which creates a gap between them. When the pages turn, they have to shift, and once they’re glued, they lose that ability. I wasn’t sure what was going to happen to the next sections of the book because of this. In this section of the book, the young woman has gotten married. She is living with her new husband as she gets to know him. She discovers she’s pregnant and wonders how to tell him. She thinks about how much she loves pleasing her husband, making him happy, and about how wonderful it will be to have his child. 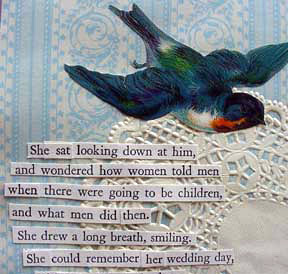 Although the actual wedding takes place much earlier in the chapter, I used the details from the wedding in this poem as a memory, as she thinks about the vows she made that day. I am really happy with this poem. I think it expresses the young girl’s innocence and love in a way that many of us can relate to– that sense of hope when first married and the excited anticipation that occurs during pregnancy. I had decided on the text of this poem a couple of months ago, but I didn’t have any imagery to go with it. So I went to Ebay and looked for magazines from the early to mid thirties, which was when this book was written. When the magazines arrived, I looked for pictures that would relate to the theme of being a bride, and I was amazed by the advertising that I found. I thought it was a great juxtaposition of the ideas in the poem. 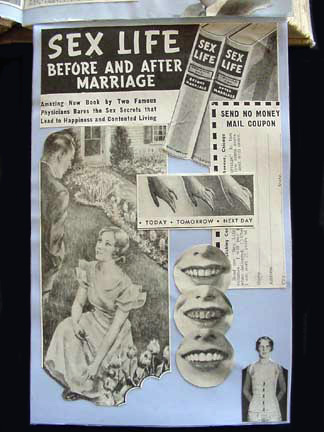 The ad techniques had so much to do with shame and the fear of not living up to a certain set of standards as a housewife, lover, and mother. Of course, I knew these views of womanhood existed, but seeing these attitudes expressed in print really made me think about how lucky I am for the freedoms and luxuries I have and often take for granted. and what men did then. She drew a long breath, smiling. three Easter lilies and a small black Testament. It was sweet to be married. It would be sweet to be a mother. Already there was this possibility. and excited by a faint, not unpleasant fear. it was not always easy to do, but she knew how. for him there was only one way. Because I had so many images that I wanted to include in this page, I decided that I needed to expand my space by making some flaps. I was afraid that if I used flaps that open up to the sides, that the advertising copy would be too overwhelming, so I decided to make flaps that open up and down instead. First I cut two pages of heavyweight copy paper the same size as a single page in the book. I took off a little in the width to make sure that the pages could open and close freely and added about an inch in length to insert between the other pages for the flap. I glued the decorated paper to the front of each page and applied the adhesive blue vellum to the back. I made a fold at the top of the left page and the bottom of the right page, checking all the time to make sure that the length of the flap matched the length of the book page. Next, I put glue on the front and back of the 1″ flap and tucked it between two pages that I had previously glued together. (I had left the top and bottom edges unglued so I could insert the flaps.) I folded the pages down, closed the book, weighted it, and let it set. I started decorating the outside first. I made a fold line on the heart doily and cut it in half. I glued the two halves onto the two sides of the spread. 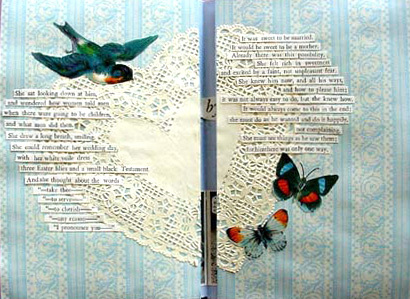 Next I laid out the text and the bird and butterflies around the heart and adjusted the spacing. When I was happy with how it looked, I glued everything down. When I glue down strips of text, I use a very tiny paintbrush and a pair of surgical tweezers that have a very, very narrow tip. 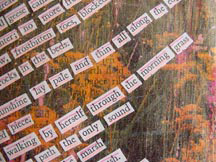 I grab a piece of text with the tweezers in my left hand, turn my hand over, apply the glue to the back of the strip with the paintbrush, and then use the tweezers to lay the text on the page. I use the back end of the paintbrush to tap down the text and then smooth it down with my finger. I worked on the inside of the spread next. I had already removed the advertising images that I wanted to use from the magazines. I spread them out across my desk and started trimming them in different ways. On some I left sharp, straight edges. For other images I cut or tore around the edges. Then I laid everything out onto the pages. 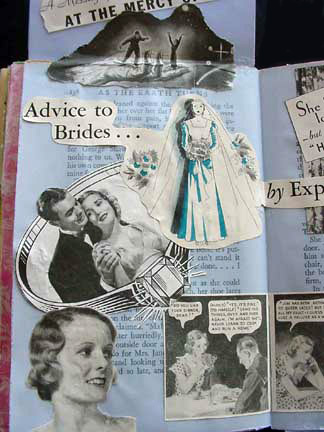 Doing collage this way is like putting together a puzzle without using the box lid! It took me several hours to get everything placed right. I had to be careful about the folds to make sure nothing important got lost in the gutters. I also tried to balance text with imagery and give a good balance of open space between the pictures so it wouldn’t be too overwhelming. Even when I had everything where I thought I wanted it, I still changed things around as I was gluing. And I made a few mess-ups here and there, which I hope no one else can see! Go easy on the glue when using vellum; it wrinkles really easily. 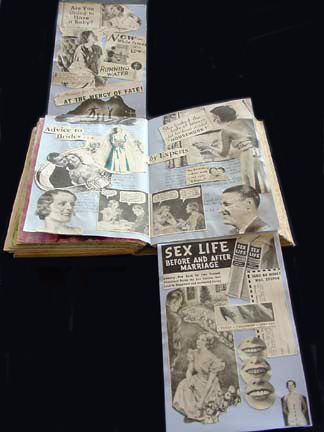 If you want to see some more altered book art ideas, be sure to visit the other chapters of As the Earth Turns ~ Summer and Winter.